The only first round match in the 2017 Longman Cup competition took place between Pendle and Crake on the Pendle clubs’ courts at Earby, near Barnoldswick on 25 May. Against a minimum low bisque team from Crake, of Messrs. Ian Hall (4), Jim Allcock (5), Ivan Wheatley (7) and David Lloyd (8), the entire Pendle team comprised Double Figure handicap players, namely Paul Dowdall (10), Robin Delves (10), Peter Dewhurst (11) and Libby Dixon (24 but playing off 20). It was a very close encounter on The Hottest Day of the Year. Four Courts were utilised, to avoid double banking. In spite of this, there was at least one occasion, from both teams, when a player arrived at the wrong hoop. 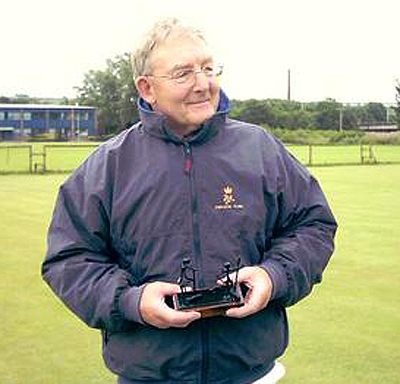 Only Libby Dixon scored maximum points, winning her afternoon singles against David Lloyd (plus 24), having previously won the morning doubles, in partnership with Peter Dewhurst when Ivan Wheatley & Jim Allcock were defeated (- 13). Both morning singles were won by Crake, Ian Hall (+ 16) v. Robin Delves and David Lloyd (+ 7) v. Paul Dowdall with Paul ‘s navigation of hoops in error. However, the Player of the Match award (the remnants of the Trifle ), went to Paul Dowdall – playing off 10 for the first time – beat the Crake number one, the experienced Ian Hall. Ivan Wheatley was the only winner for Crake in the singles, beating Peter Dewhurst (+ 13). The deciding game between Robin Delves and Jim Allcock was an error strewn exhibition, occasioned perhaps by heat exhaustion, Longman nerves & Anno Domini. But the PENDLE Captain prevailed (+ 4), when Jim Allcock arrived at the wrong hoop, just as full time was called.